Science fiction writer and independent scholar or Roman history Mary Jane Engh is collaborating with Washington State University professor of history Kathryn E. Meyer on a project to collect information on all the women in the ancient Roman world (through 527 CE) who were documented as playing a role other than (or in addition to) wife, daughter, mother or mistress. The work, Femina Habilis, includes tradeswomen, politicians, thieves, doctors, poets and scientists - or their equivalent during that period of history. Among entries you can sample is one the alchemist and writer "Maria"
She was a principal founder of Graeco-Roman alchemy, the experimental science of its day. A Greek-speaking Jew, she probably lived in Egypt. She gave the earliest known descriptions of many items of chemical apparatus, some of which she presumably invented or developed. Because of its connection with cooking, alchemy was known as "women's work." The writings of other women alchemists such as "Cleopatra," "Isis," Theosebeia, and Paphnoutia suggest a community of women was working in alchemy at this time. I'd like to imagine that was the case, but I'm skeptical that that is any more than wishful thinking. It would make a cool story, though. If you are interested in the history of women and alchemy, you might want to visit Robin Gordon's scholarly women alchemists site. It's focus is 16th and 17th century women who worked in the chemical arts such as Marie Meurdrac. 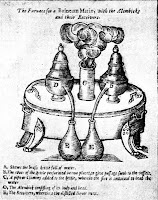 Image: "... sketch of an apparatus for distilling by the aid of boiling water. The bath wherein the vessels are placed in Fig. IX. was called by the alchemists balneum Mariae, from Mary the Jewess, who is mentioned in the older alchemical writings, and is supposed to have invented an apparatus of this character." From The Story of Alchemy and the Beginnings of Chemistry, by MM Pattison Muir.